There is a new film being welcomed to theaters. A film of which has touched the hearts and uplifted many across the globe. A film of which can make you feel tragic mourning in your heart, yet grow with strength, virtue and joy as well. The film I refer to is the Martin Sheen starring, Emilio Estevez directed, The Way. A film I was honored to view on October 13th at the Heartland Film Festival at the Indianapolis Museum of Art. Like many other reviewers, I do agree that Emilio Estevez deserves a win for Best Director and Martin Sheen for Best Actor, but this is a work of art and a work of inspiration. For that they also deserve a thanks from many who’s hearts have become enriched from the film. It is a true masterpiece. Emilio Estevez gives a career enriching and momentous direction to the film. Every moment has the heart and soul of the characters and within the story, you begin to feel yourself becoming thrust into the story and you forget that it’s a work of fiction. This is truly Estevez’s most inspiring work, bringing tears and smiles to many. The score to the film is uplifting and inspirational and the soundtracks carries with it songs that help the mood and tone of the film. Every piece of music either brings sorrow or joy to each scene and helps us delve deep into the hearts of the characters. There is no doubt that Martin Sheen gives a commanding performance here. One of the best of his career, he carries the audience on his personal and grueling journey or grief, mourning and triumph. From America to across the ocean, he portrays Tom, a Doctor and a father who has just lost his son on the Camino de Santiago, the Way of Saint James. Martin Sheen has always been a joy to watch and here he shows full emotion and devotion to his craft in a performance that will ripple unto many aspiring actors. Tom meets, along the way, a great group of supporting characters from different locations around the world that help to inspire him and raise his spirits with laughs and at some points, bring him conflicting emotions. 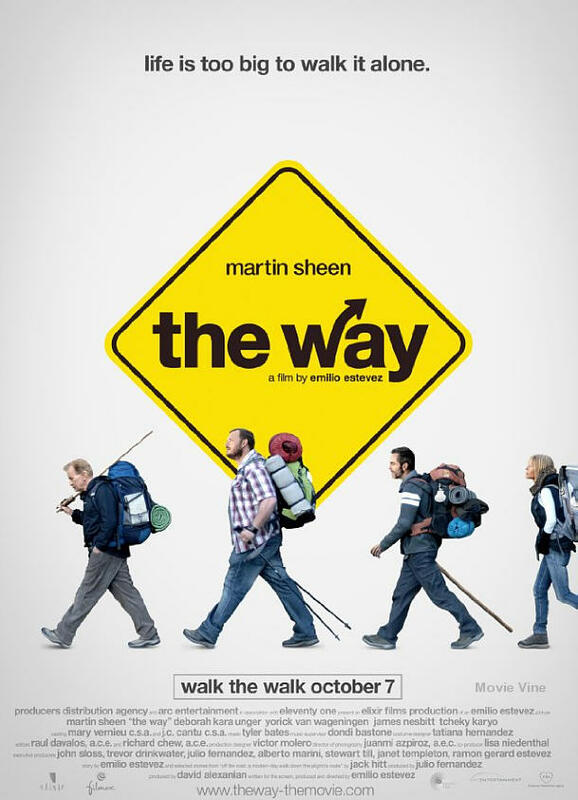 The Way is one of my favorite films of all time, if not my favorite. Every ounce of emotion in the film tugged at my heart and made me quake with the same pride, sorrow and struggles that Tom faced. The film is certainly one of the most inspiring and can help you search inside yourself to carry on after life brings you agony. I’d recommend Emilio’s film to any of my friends and family and would be grateful to those who gave it a chance and viewed it. It can change your life and help bring you inspiration, as it did me. Comments for Heart, Tragedy, Inspiration: A Review of “The Way” are now closed.